The Sharp AL-1457D laser printer is a good solution for small homes and offices needing a copier, scanner, and printer. The AL-1457D all-in-one printer delivers good quality output at a reasonable speed. Copying speeds can go as fast as 14 ppm while printing speeds can go as fast as 12 ppm. Unlike other multifunction printers, the Sharp AL-1457D printer does not have a fax. The Sharp AL-1457D copier printer has dimensions of 51.8 x 44.5 x 37.9 cm and weighs 21.3 kg. It has a maximum monthly duty cycle of 2000 impressions and it can handle up to 300 sheets. The Sharp AL-1457D has a monochrome laser printer at the bottom along with a paper cassette and paper tray and a flatbed scanner on top with an automatic document feeder, which can handle 30 sheets at a time, on the cover. This hardworking printing, copying, and scanning machine is reliable and efficient. The Sharp AL-1457D's output is generally good and delivered at reasonable speed of 12 ppm for prints and 14 cpm for copies. The easy-to-use Sharp AL1457D is also budget friendly, with reasonable running and initial costs. Only Windows users will be able to use the Sharp AL-1457D digital copier printer as it does not offer support for Macintosh operating systems. 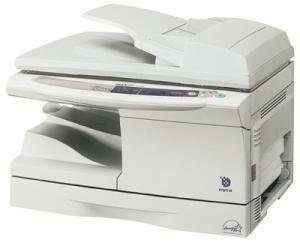 The AL-1457D multifunction printer does not have a fax machine or a convenient duplexer.